The U.S. Forest Service Lake Tahoe Basin Management Unit hosted Republic of the Union of Myanmar delegates Su Hlaing Myint, Swe Zin Phyo, Thin Thin Aung, Thurein Htun, Bawk La, Timber Management Officer Robert Guebard, Interpreter San Ohn, Fuels Battalion Chief Kyle Jacobson, Soe Shwe, Public Affairs Specialist Lisa Herron and Mya Nandar Thin. 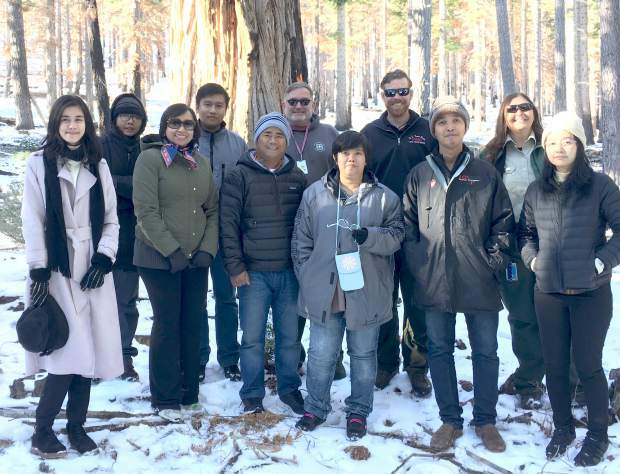 Seven delegates visiting from the Republic of the Union of Myanmar in southeast Asia got to see snow at Lake Tahoe this past week. 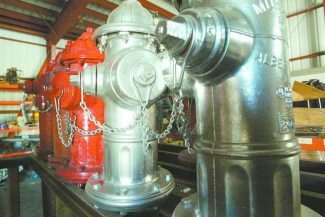 The delegation learned about forest health and the benefits that forest thinning projects provide to the forest and surrounding communities and the importance of removing excess vegetation that can feed wildland fires, according to the Forest Service. Each year nearly 5,000 exchange participants come to the U.S. through the program. The objective of International Center is to foster better understanding between people through public diplomacy programs and serve as a resource for local residents as well as visitors interested in international activities and events. Key programs include organizing programs for international visitors through the U.S. State Department and other federal agencies, providing interpretation and translation services in over 60 languages and organizing educational events and activities for the university and general community. To learn more, visit eca.state.gov/ivlp/about-ivlp and http://www.unr.edu/nnic.